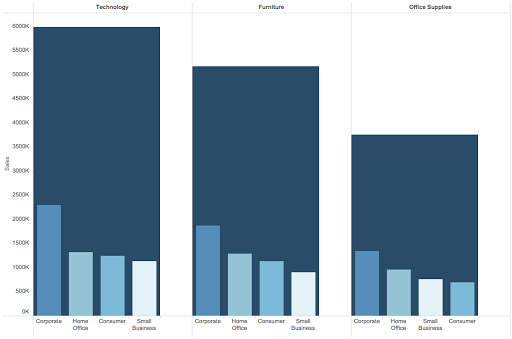 Former Data Schooler Nicco Cirone posted a challenge to the team at The Information Lab Monday to create this alternative to a Marimekko chart. Nicco got the idea from this post by Jon Peltier about the problems with Marimekko charts. Give it a shot. It’s a bit tricky and one you will surely learn something from. There are several very subtle tricks in here. Try to match mine pixel for pixel. If you want to use the same version of Superstore Sales that I used, you can download it here. If you think you have it and want to check to see if you got it right, you can view the final solution on my Tableau Public profile here. I used a similar method, but I used a FIXED LoD calculation instead of an EXCLUDE. Are there any advantages to using EXCLUDE over FIXED? Both will work fine. It's just personal preference in this case.